This Waldorf Astoria resort boasts five golf courses and 17 tennis courts, not to mention other lavish amenities for individuals, couples, families, and pets. With a playground, cribs, high chairs, kids menus, children’s salon services, and kid-friendly pools, it’s the kind of place where multiple generations can relax and enjoy traveling together. Book one of the resort’s pet-friendly spaces and take your pooch on one of the many dog-friendly hiking or jogging trails; you can even book doggie massages. 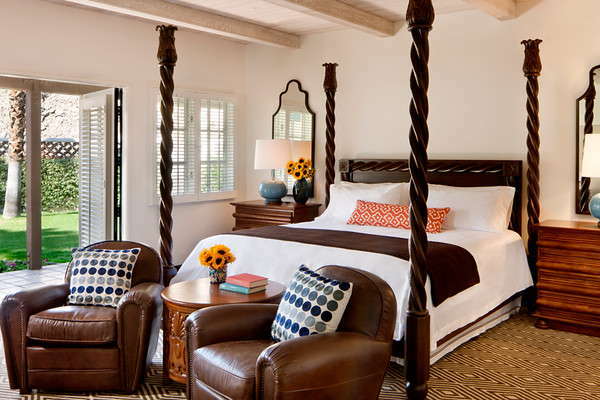 The 796 rooms spread among casitas, suites, and villas provide a variety of options. 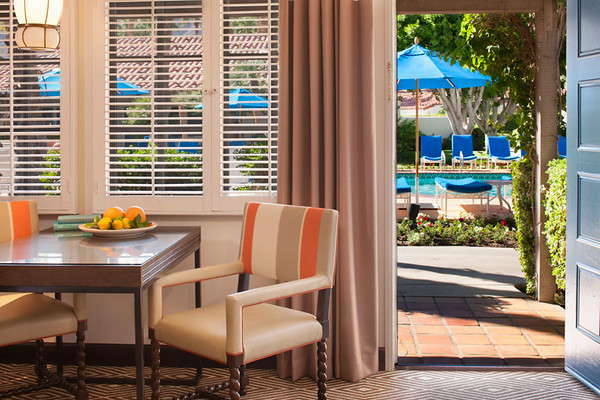 All rooms have mini fridges, a patio or terrace, and tasteful decor of neutral tones highlighted by enlivening patterns that call back to the resort’s 1926 origins. Bathrooms are appointed in quaint hand-painted Talavera ceramic tile. All rooms include showers, though some also have bathtubs, too. 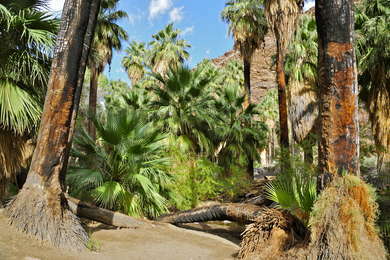 Palms, pines, and manicured hedges line the drive as guests enter the property and head to the u-shaped outcropping that make up the main buildings. Guests enter through a portico flanked by two golden knights to find themselves in a room whose lofted, exposed-beam ceilings are dotted with dark iron chandeliers. 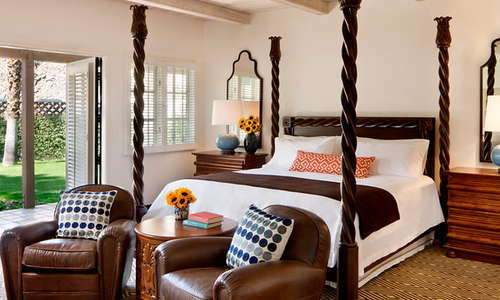 Warm leather seating rests atop the caramel tile floor and there’s even a fireplace. A plaza and fountain complete the Spanish-style mission and blend outdoor and indoor spaces effortlessly. With a total of 41 pools on the grounds, there’s no lack of swimming options. The main pool is kid-friendly and also features a hot tub and fireplace; guests can rent private cabanas. The Plunge Adult Pool is designed with guests ages 21 and up in mind. Casita pools, with poolside bar service, are placed throughout the property. Spa Villas host their own lap pools and a handful of exclusive luxury suites have private pools. 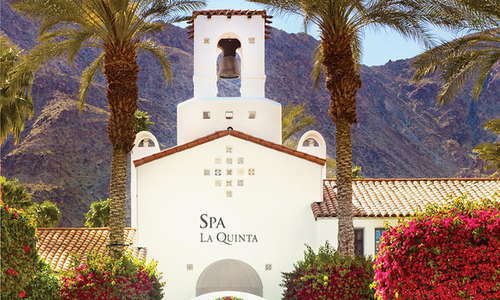 The Spa La Quinta is in another mission-style building, complete with a tower and bell. Services include body treatments, facials and peels, massages, and prenatal options. The spa showcases ZENTS products—a body and skin line made with only natural ingredients. At the adjoining salon, guests can book hair, makeup, and nail services, including manicures and pedicures for children. The fitness center has expected machines and weights, and also offers classes and personal training, but being in the outdoors is the focus here. 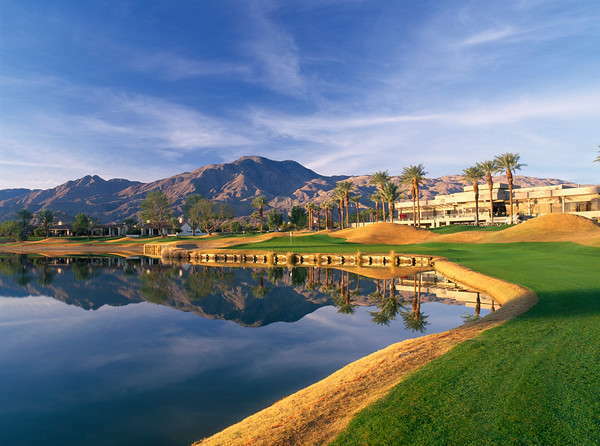 The five lush golf courses host some of professional golf’s more prestigious tournaments. 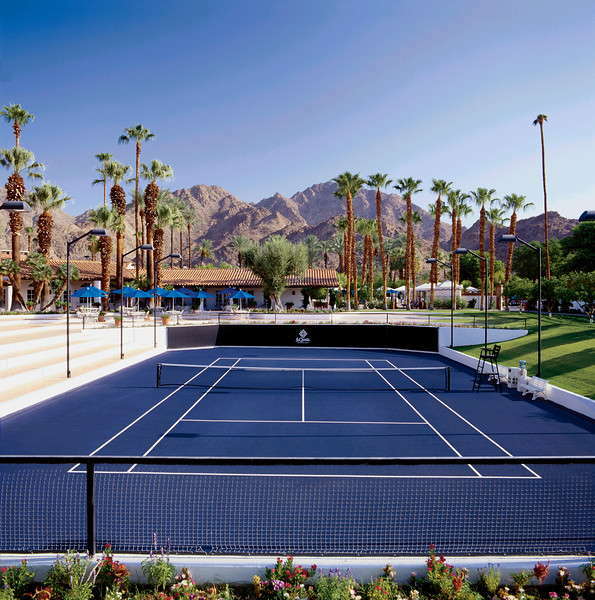 The tennis courts, which also offer lessons from pros in town for the annual BNP Paribas Open, hosted in nearby Indian Wells. 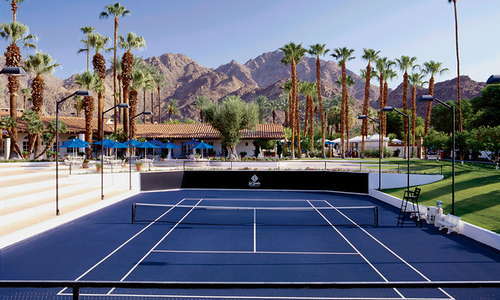 Additional options include pickleball courts, bicycle rental, and a bevy of hiking and jogging trails. The resort’s seven restaurants each offer unique options. Centre Court Cafe is a grab-and-go joint. Adobe Grill is a casual Mexican eatery, while Ernie’s is a sports pub. Out on the courses, MD Grill can feed hungry players appetizers, sandwiches, or burgers or Wallaby’s West offers casual breakfast and light lunch fare. At Twenty6 you’ll find a casual bistro serving comforting cuisine at breakfast, lunch, and dinner. The one fine dining spot, Morgan’s in the Desert, is open for dinner only and is the proud recipient of a Wine Spectator Award of Excellence. MD’s daytime bar closes in the early afternoon, except on Monday nights during football season when the bar hosts a viewing party. Try one of 100+ tequilas at Adobe grill, take in live music Tuesday-Saturday at Morgan’s, or indulge one of the beer, wine, or cocktail options at Twenty6, which closes latest, around midnight. An Enterprise rental car location is available on-site and the resort is partnered with Tesloop, for transportation from locations around L.A. and Orange County. Preferred air transportation is provided by Blade (helicopter service) or SurfAir, a private air travel service within California. 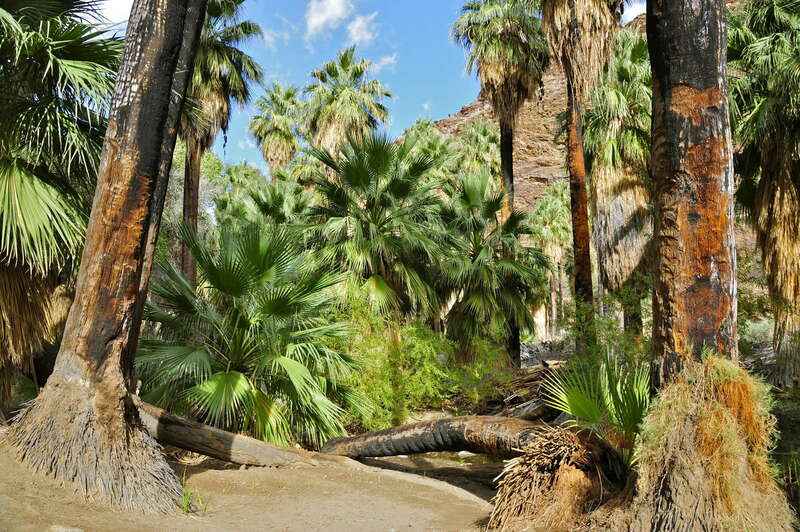 Though you rarely need to travel off the resort grounds, terrific dining options are found throughout the valley. 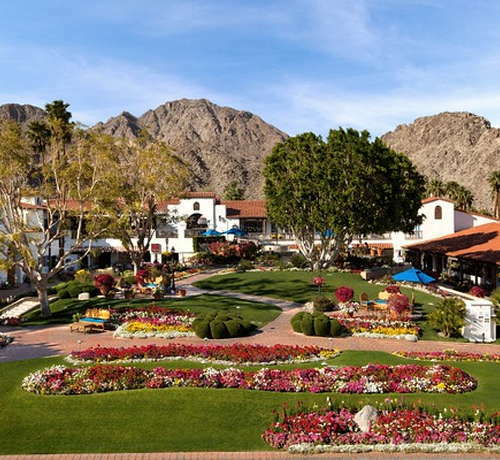 For upscale casual dining and an amazing outdoor patio, try La Quinta Cliffhouse (7-minute drive), a spot literally built into the side of a mountain. 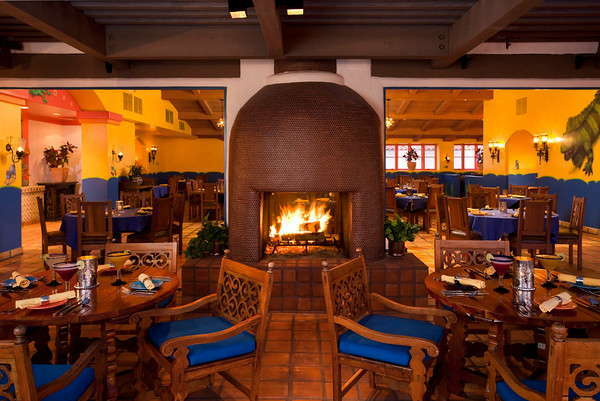 For other unique experiences, head over to Old Town La Quinta, where Solano’s (3-minute drive) is a “West Coast bistro” showcasing coastline cuisine. Or, take a trip to Shield’s Date Farm (8-minute drive), a quirky roadside attraction that has a truly lovely garden patio and have a lovely al fresco lunch. 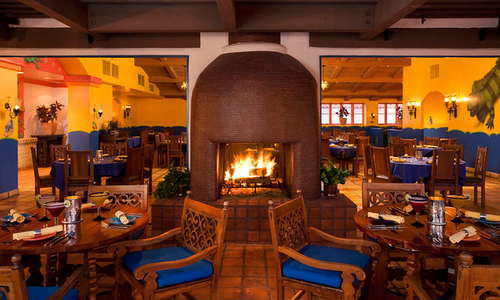 Casa Mendoza (4-minute drive) in Old Town has good food and even better margaritas. Don’t let the strip mall setting of Cork & Fork (4-minute drive) throw you off; the bistro and bar boasts an excellent wine list. For something different, try one of the saketini options at Okura Robata Grill & Sushi Bar (7-minute drive). 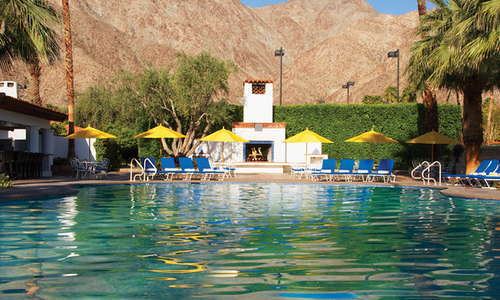 The desert’s first resort has remained a top notch experience for more than 80 years. Between all the amenities—including the dozen or so boutiques, like a Polo by Ralph Lauren outpost—it’s hard to imagine ever being bored, though the resort also focuses on ensuring guests are able to relax, too. 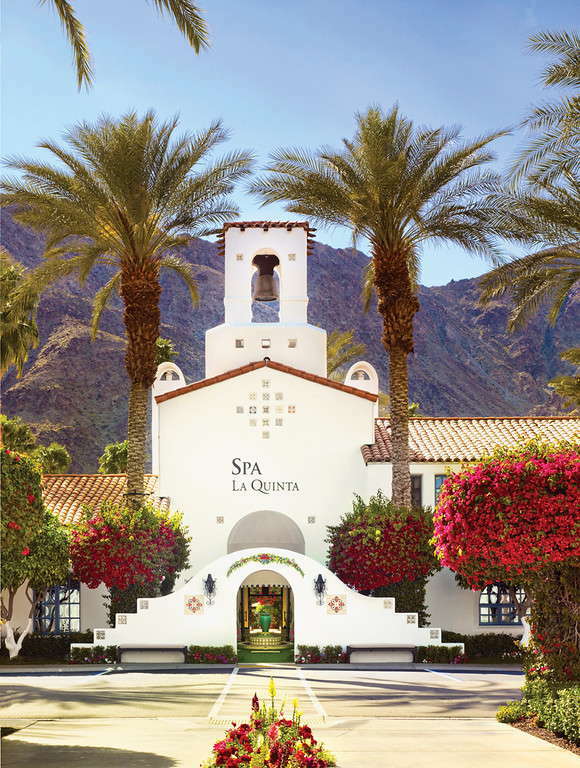 The offerings are impressive on their own, but add in that Hilton Honors members can receive points and potential discounts, the resort publishes its own magazine, Hideaway, and that La Quinta Resort & Club takes their green initiatives very seriously, and it’s even harder to imagine why you’d go anywhere else.